Home Church Can You Feed Just One? What does doing ministry look like? I guess some would say going to church, reading the Bible, teaching and Bible studies. I would agree these are all ways to work in the ministry. Let’s take a look at a few ways Jesus did Ministry….Luke 3:23 states Jesus was about 30 years of age at the start of his ministry. His ministry looked something like this….teaching, preaching and serving others with compassion. I don’t have enough time to describe all He did in His ministry, but we have seen the many, many things He did through scripture. I ask myself am I doing ministry how God would have me be? The Lord has been speaking to me in a super natural way of “doing ministry” and has been asking me a specific question “Can you feed my people?” And yes specifically the hungry, the less fortunate, those who have been forgotten, the homeless, the widows and the elderly. He may be asking you the same questions. 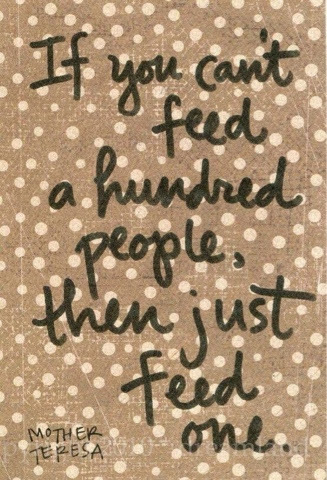 I have came across the above picture several times that reads “If you can’t feed a hundred people, then feed just one”. I am praying and asking God to first forgive my selfish heart and let me be more aware of that one or a hundred or any in between. I am asking Him to forgive me for not having a heart to do it before now. You don’t have to look far to see people that are in need, you just have to be looking with an open and willing heart. Can you help at least one? I pray that God will speak to you as He has been me.